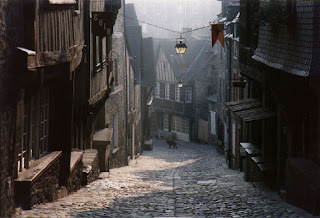 The two friends left the horrific scene at the Silver Lion Inn and headed down the hill towards the docks. The smell of the sea permeated the entire area and a cool summer wind blew up from the ocean and through the streets tossing Queless’s hair about. It felt good to have clean air to breathe and the smell of the ocean invigorated him. “One day twould be magnificent to sail these fair seas looking for adventure on the open ocean.” Queless murmured. “Not fer me.” Morin said “I prefer to keep me feet on solid ground. Whatcha gonna do when that ship yer on goes down? Plus Dwarves don’t swim, we sink.” Queless smirked but kept his comments to himself. Queless began to walk away from the guards and turned to convey one last thought. “Focus thine anger elsewhere Vendall. We are not responsible for thine arrest. We will try to find an advocate for thee in a few days.” Vendall looked Queless in the eyes and nodded. His shoulders slumped and Queless could tell that the anger had either been redirected or left the trader entirely. The guards hastily exited the Dock Ward before a crowd could grow. Queless and Morin left Dock Ward and started the long walk to Piergeron’s Palace. Along the way a tough looking gang passed heading into the lower dock wards. One man was over 9 feet tall and inhumanly muscular. His skin had a bluish tint and he wore strange tribal garb and armor made from chitinous shell with spikes protruding from it. His hair was long and he was heavily armed. The man glanced at Morin and Queless but continued on his way. “It matters not to I my good friend, wherever you wish to eat is fine with me.” Queless said. “Aye, we’ll eat at Boduccio’s Dockside. I’ve heard it’s a good place, although we’ll have to backtrack a bit. It’s down on the waterfront. Follow me!” Morin turned on his heels and walked back down the hill. Queless followed Morin back down to the waterfront. Many enormous and beautiful ships were docked here along with small fishing skiffs. The waterfront was alive with sailors unloading cargo and fish. A few stands sold fish for a discounted price to the public after dealing the majority of their goods to the local restaurants and inns. The smell of the fish and garbage mixed with the occasional fresh breeze blowing in off the sea. A large wall ran the length of the harbor straight through the water with a few breaks here and there to screen and allow ships in and out of the City of Waterdeep. Large groups of men fresh off of ships laughed, drank, and walked the docks and waterfront area. Visitors and locals meandered through the crowds of fishermen and sailors looking for a good deal or tasty meal. Morin pointed out the establishment at which he longed to dine, Boduccio’s Dockside. BODUCCIO’S DOCKSIDE – Note link to map of dining establishment. Location: Dock Street (Dock Ward) Right on Waterfront 1/2 block west of Odd Street. Boduccio’s Restaurant is a fine dining establishment right on the Docks of Waterdeep. The prices are high and the view magnificent. There are three walls of windows that allow patrons to lookout onto the harbor while they eat. Boduccio’s specializes in foods from around the realms and fine wines. Vincelli Boduccio is the owner of this fair establishment. A native of Tethyr, he came here to escape the ravages of the wars and regain his former wealth. At one time he owned large amounts of vineyards. Vincelli is very charming and courteous, especially with the noble women of Waterdeep. He is also an expert on wines and while he maintains an air of nobility about him, Vincelli often brings food to Waterdeep’s homeless. There are some rumors however, that say Vincelli has more than a few dealings with ‘the city below’ although no one can prove any of these stories. Vincelli makes sure to keep on the good side of the City Watch, giving them a warm drink during the winter (or cool one in the summer) free of charge. Vincelli Boduccio is becoming quite successful in his venture and is quickly becoming ‘the new thing’ in Waterdhavian Society, especially with the nobles. “Let’s make haste to Piergeron’s Palace to collect our reward!” With that Morin was off like a stallion, using the energy of the fine food and wine to power his small but strong and muscular legs up the great hill towards the Castle Ward of Waterdeep, the City of Splendors. Before long the two were at the giant steps leading up to the entrance to Piergeron’s Palace. “I guess we should keep this as low key as possible.” Morin said. “We don’t want to draw any extra attention to this as Council Member Grendmeer Mendothian wanted us to keep the job silent. Shall we?” “Let us proceed cautiously and see if we can meet and parlay with him.” Queless said. After climbing the steps two guards blocked the way. Luckily the council member stood just inside the entryway perhaps watching and waiting for the two. He moved forward and spoke quitely to the guards who nodded and allowed entry. “Council Member Mendothian, The Fellowship of Lighting have returned to claim what is rightfully ours. We must also petition thee for sponsorship and discuss certain matters in private.” Queless said to the council member. “We will definately consider using your services in the future, thou hast done well.” Council Member Mendothian adopted the Dalelander tongue for a moment in respect of Queless and his proper ettiquette. Council Member Grendmeer Mendothian took the adventuring guild paperwork and passed it on to his secretary who immediately carried it downstairs. “Now, we promised two magical items. Here are your choices, choose carefully as I cannot allow you to come back and exchange your item for something different. You may each pick one and discuss it privately if you wish before you choose. We value your privacy so let me know if you need more time and I will step out of the room for a moment.” The council member opened a drawer of his desk and began to pull out various magical devices and set them upon the table explaining each as he went. Bergett’s Deck of Many Things : A special Waterdeep version of a Deck of Many Things- Please take warning that some of the effects could be harmful and the City of Waterdeep is not responsible for damage caused by these. The user is entirely responsible for the useage of this magical device within the city. Khelben “Blackstaff” Arunsun Rings of Item Teleportation : Counts as 2 items – 1 ring goes around an item or is tied to it. The other goes on one’s finger. When the magical command is spoken that item will teleport to the wielder. This will only work with basic items such as a weapon, shield, magical wand, and numerous other basic items. Devices that contain portals to other dimensions or planes cannot be teleported such as a bag of holding. Fangtide the Shortsword : This shortsword was created by a mage/thief named Fangtide who lived in the Dock Ward over 20 years ago. In trying to create a magical shortsword which would help him hide in shadows and move silently more effectively (something he was never good at) he accidentally fouled up his creation spell and placed himself in the sword. He could not escape and many attempts to magically free him only caused him pain and hardship. He agreed to live his life in the sword as long as he could stay in Waterdeep, his hometown which he holds great love and respect for. He knows many of the streets and alleys in Waterdeep, especially in the Dock Ward. Growing up in Waterdeep also taught him street smarts. The wielder of the blade, once bonded with Fangtide will be able to gain special knowledge about certain locations and individuals within Waterdeep. They will also be able to use some basic thief abilities even if they are not a thief. The sword operates as a +2 weapon and +4 when wielded by a halfling. If wielded by a halfling mage/thief from Waterdeep this will function as a +5 and add +10% to all thief ability checks! The sword will only live for 24 more years at which point Fangtide will die and his spirit fade from the sword making it an ordinary shortsword. Gertrude’s Magical Bakeware : These magical pans and pie tins will allow even a novice baker to prepare the most delicious dishes from scratch! Only minimal cooking experience is required. Note: these can only be used in bakeries within the City of Waterdeep. These could be sold at high profit to a local baker as everyone remembers the legend of the famous baker Gertrude of Sea Ward. Memminok Freingwend’s Gavel of Truth : When struck upon a large piece of solid wood all creatures within 40 feet must save vs. spells or be unable to speak a lie for 1d10 rounds. Creatures may flee as normal, but if asked a question they cannot respond with a lie. If they try they will not be able to speak. Note: this magical device only functions on the living and those able to speak in a tongue understood by the user. Ve’s Hypnotic Harp : This magical harp when played by a skilled musician causes all creatures within 60′ to issue a save vs. spells or be drawn like zombies to the music. They will stand and simply sway to the music for 1d10 +2 rounds or until attacked. Note: the harp is over 200 lbs. and must be moved carefully by professionals as it is quite old and delicate. Ve was a master craftsman of musical instruments in Waterdeep over 150 years ago and this is but one of his many creations. JubJub’s Charismatic Longbow : A longbow crafted by the dark skinned master bowyer/fletcher JubJub in the South Ward for those of great flamboyance and beauty. In addition to normal modifiers to the bow weapon this also grants a +1 for every 4 points of Charisma the wielder currently has. Queless and Morin gave their thanks and exited the palace with completed paperwork in hand. The Fellowship of Lightning was now official. They could now prove to guards and other groups that they were a legitimate business and were available for legal hire in and around the City of Waterdeep. Now it was up to Morin and Queless to find and add new members so that they would be able to take on bigger missions. They stopped at the First Bank of Waterdeep to deposit the paperwork, platinum, gold, and a few other valuables that they wished not to carry with them. After that they were off to the Spires of the Morning – the temple of Lathander Morninglord to speak with Misha regarding those that might assist the Fellowship of Lightning in their ongoing pursuit of the evil vampire who seemed intent on stopping them from discovering the truth behind the ancient necromantic magical devices planted about the city. After walking for an hour or so the Velvet Champion sped by and came to an abrupt halt before them. “My friends! If you would need my services again please climb aboard!” They took him up on his offer and made it to the Spires of the Morning in but a few minutes. Morin paid him extra and dropped a platinum piece into his hands. “Thank ye kind sires! I shall be at your beck and call. Should you need a ride anytime please blow this magical whistle.” The Velvet Champion handed Morin a purple whistle, smiled, and took off like a bat out of the nine-hells. The great temple of Lathander stood tall and proud before them. A few priests stood outside talking, they all carried book and looked to be acolytes.